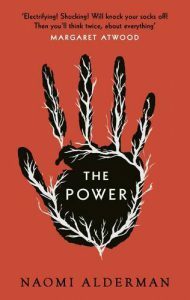 The problem with a book like The Power is that it can end up being overwhelmed by its own premise. Say to your average reader (and certainly your average science fiction reader), "It's about a world in which all women, everywhere, suddenly develop the ability to shoot bolts of electricity out of their bodies" and they'll be off to the races, picturing and imagining the many possible outcomes of this scenario, spinning their own stories rather than waiting patiently to see which one the author will choose to focus on—a choice that could very well end up feeling disappointing, a diminution of the limitless possibilities we started out with. So it's to Naomi Alderman's credit that she manages to make The Power her own, to take its instantly evocative premise in a direction that only she could have envisioned, and which she clearly intended from the book's first page. Even if it takes her a little while to get there. To begin with, The Power addresses the infinite possibilities inherent in its premise by trying to take a panoramic view of the changes that occur in the world once the Power begins to manifest itself. We mainly follow four characters. Roxy is the illegitimate daughter of a British-Jewish crime boss, who witnesses her mother's murder and is then folded into her father's organization when her abilities are discovered. Allie is an abused foster child, who has been guided all her life by a voice which may be the canny survival instinct of a girl who has learned that she can trust no one but herself, and may be the actual voice of god. Tunde is a Nigerian journalism student who captures one of the first instances of the Power being used in public on camera. He drops out of school and begins traveling the world, chronicling the unrest and upheaval that follow the Power's emergence. Margot is a middle-aged American politician, whose career takes off after she comes up with tactics to respond to a new generation of young girls born with the Power. The four characters all end up being movers and shakers in the major world events that follow the Power's emergence—Allie rebrands herself as Mother Eve, the leader of a new, quasi-Christian religious sect, and Margot ascends the ranks of the American political establishment at a breakneck pace. But Alderman also uses them as viewpoints on the broader implications of the upheaval. Through Tunde's eyes, we see how the Power is used to combat open misogyny and the oppression of women. He witnesses a revolution in Saudi Arabia, and a riot in Delhi, where women who have been protesting peacefully for years are now simply making "a show of force" (p. 133). Full of brutality as these chapters are, the events they depict could almost be described as lulling readers into a false sense of security, and of having understood what The Power is about (especially since they indulge in some predictable Western stereotypes of how women are treated "over there"). They fall into the familiar superhero story template, in which individuals with powers target "bad" operators while leaving larger institutions (which are assumed to be good) intact. But when we switch to Margot’s perspective, we see the panic of political institutions even in supposedly egalitarian countries like the US. When her boss, the governor, learns that the young girls who originally began manifesting the Power can activate it in older women, he demands that all public employees be tested for it. (In what appears to be a perfectly deadpan jab at some of the current follies of American politics, he explains that "You can't have someone employed in government buildings who can do that. It's like walking around with a loaded gun" [p. 63]). Government agencies scramble to find a "cure" for the Power, and failing that, a way of countering it. When both efforts fail, the book has a political operative working for Margot's opponent muse that while everyone is pretending that politics is still business as usual, "They're waiting for something to happen. We're only pretending everything is normal because we don't know what else to do" (pp. 165-66). Left unspoken, and yet screaming off every page of The Power, is this simple truth: at the foundation of all the structures of our societies, even the ones we consider "good" and progressive, is male supremacy. And male supremacy is rooted in the potential for violence. Even if that potential is never actualized, and even in societies in which it is (mostly) frowned upon and punished when it is expressed. If you reverse the direction of violent potential, if you make women stronger than men, then you upend the very foundation upon which civilization rests. Things will not be able to continue as they were, and complete upheaval might very well be inevitable. The problem with that, of course, is that depicting complete upheaval is very difficult, and doing so without arousing your readers' impulse to second-guess, to ask "Wait, would things really play out like that?" is very nearly impossible. All the more so because Alderman's project with The Power is not—because it can never be, because this is not what any writer ever sets out to do—to write a social history or capture what would really happen in the event that the utterly impossible what-if she started from actually occurred. She's trying to tell a story, and yet in the first half of The Power, as fascinating, and as full of chewy, thought-provoking moments as it is, that story can often feel as if it's gotten lost in the shuffle. Whether it's Roxy's storyline, in which things stay fundamentally the same—she and other women slip effortlessly into her father's crime organization, performing functions previously reserved for men—or Allie's attempts to foment worldwide revolution, The Power feels less like a coherent argument, and more like an attempt to cover all bases. Under that influence, who could help but be violent, who could help taking what they want instead of asking for it or accepting that you might not get it? This isn't about men and women, not really. It's about the impulse to control, to dominate. And it's about the social conditioning that teaches us to look at people who do these things and see, not bullies and warlords, but leaders and visionaries. By reversing the dynamic of power in our society along the axis of gender, Alderman isn't commenting on misogyny so much as she's saying that there's a sickness that underlies it, and runs much deeper. That misogyny is only one expression of it. It is, at this point, worth pointing out that one of the ways in which The Power fails to fully explore this premise is in its near-total silence on the subject of race. It's never suggested, for example, that the new gender dynamics of the post-Power world are informed by preexisting racial tensions, though we would surely expect them to be. Neither do Tunde, a black African, or Allie, a biracial American, have very much to say about the role of race in their lives either pre- or post-Power. By the same token, though the book imagines that the lines along which the Power is distributed are not clear-cut—there are small numbers of women who don't manifest the Power, and men who do—the existence of transgender and intersex people is completely ignored, as is homosexuality. These are all axes of power and oppression that play into Alderman's central topic, and it's unfortunate that they weren't discussed. Something that I haven't mentioned yet is that The Power's narrative is framed by a correspondence between Neil, a member of "The Men Writers Association," and his friend Naomi, a bestselling author. Neil has written a historical novel titled The Power, which he has sent to Naomi for her comments. The narrative is interspersed by drawings of artifacts (illustrated by Marsh Davies) that make it clear that the events the novel describes happened thousands of years before the framing narrative (this is one of several very blatant tips of the hat that The Power gives to Margaret Atwood's The Handmaid's Tale, a very obvious influence). Naomi's letters drip with privilege and friendly condescension—about a scene depicting imprisoned, trafficked women, she trills, "Some of us have fantasies like that!" (p. 332), because the reality of being helpless is so unimaginable to her. Some of the artifacts reveal horrific brutalities committed upon men in the intervening millennia, such as the practice of "curbing," in which adolescent boys are rendered incapable of achieving erection without electrical stimulation from a woman ("Many men who have been subjected to curbing will never be able to ejaculate without pain" [p. 248]). It's a device that quite obviously puts gender back at the center of this narrative. The cruelty with which post-Power society treated men is something that Naomi takes as an, admittedly regrettable, matter of course, while to Neil it is a painful reality, and all the more so because his society takes it for granted. And yet the question he comes back to is, like the rest of this novel, more universal. If you can completely upend the foundations of human civilization and yet end up at exactly the same place, then isn't there a greater flaw at work? Is there another way, or do there always have to be winners and losers, strong and weak, powerful and powerless? This is the question that The Power ends on—though, if you pay attention to the names of the authors in the framing story, you might be able to guess its rather dispiriting answer—and it's what makes this novel so much more than the many possibilities inherent in its premise. 'A greater flaw at work'? As my dad would say, you're f***in' well told there is! Christian theologians call it 'original sin'. All of us, unchecked and untaught otherwise, share the desire for power and control!